Reading and share top 22 famous quotes and sayings about The Heart Of A Mother by famous authors and people. 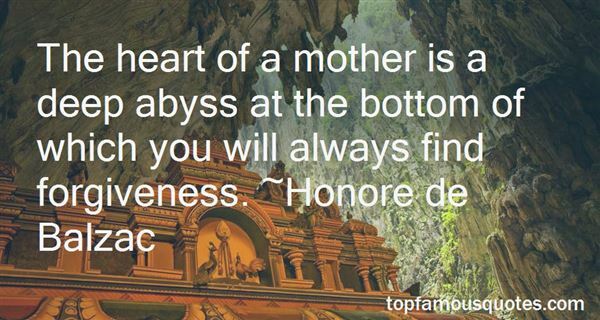 Browse top 22 famous quotes and sayings about The Heart Of A Mother by most favorite authors. 1. "Since his mother died I have seen him steam a cucumber thinking it was zucchini. That's the kind of thing that turns my heart right over." 2. "...A mother is the one who fills your heart in the first place. She teaches you the nature of happiness: what is the right amount, what is too much, and the kind that makes you want more of what is bad for you. A mother helps her baby flex her first feelings of pleasure. She teaches her when to later exercise restraint, or to take squealing joy in recognizing the fluttering leaves of the gingko tree, to sense a quieter but more profound satisfaction in chancing upon an everlasting pine. A mother enables you to realize that there are different levels of beauty and therein lie the sources of pleasure, some of which are popular and ordinary, and thus of brief value, and others of which are difficult and rare, and hence worth pursuing." 4. "This man was different from all others; he was forbidden fruit, the outsider. Her mother had trained her well, but she had never told her what to do if a man set her heart to throbbing like the hooves of a runaway horse." 5. "See the hand that nursed the serpent. The fine hasped pipes of her fingerbones. The skin bewenned and speckled. The veins are milkblue and bulby. A thin gold ring set with diamonds. That raised the once child's heart of her to agonies of passion before I was. Here is the anguish of mortality. Hopes wrecked, love sundered. See the mother sorrowing. How everything that I was warned of's come to pass." 6. "ONE MORE CHNCE. Words that my mother heard, more than once. Words that women debate. Whether you CAN forgive and whether you SHOULD trust. I think of all the judgment from society, friends, and family, the overwhelming consensus seeming to be that you should not grant someone who betrayed you a second chance. That you should do everything you can to keep the knife out of your back, and to protect your heart and pride. Cowards give second chances. Fools give second chances. And I am no coward, no fool." 7. "If you are unwilling to endure your own suffering even for an hour, and ontinually forestall all possible misfortune, if you regard as deserving of annihilation, any suffering and pain generally as evil, as detestable, and as blots on existence, well, you have then, besides your religion of compassion, yet another religion in your heart (and this is perhaps the mother of the former)-the religion of smug ease. Ah, how little you know of the happiness of man, you comfortable and good-natured ones!for happiness and misfortune are brother and sister, and twins, who grow tall together, or, as with you, remain small together!" 8. "As the love of him who is love transcends ours as the heavens are higher than the earth, so must he desire in his child infinitely more than the most jealous love of the best mother can desire in hers. He would have him rid of all discontent, all fear, all grudging, all bitterness in word or thought, all gauging and measuring of his own with a different rod from that he would apply to another's. He will have no curling of the lip; no indifference in him to the man whose service in any form he uses; no desire to excel another, no contentment at gaining by his loss. He will not have him receive the smallest service without gratitude; would not hear from him a tone to jar the heart of another, a word to make it ache, be the ache ever so transient." 9. "It's just a stupid sword," she said, aloud this time...... but it wasn't.Needle was Robb and Bran and Rickon, her mother and her father, even Sansa. Needle was Winterfell's grey walls, and the laughter of its people. Needle was the summer snows, Old Nan's stories, the heart tree with its red leaves and scary face, the warm earthy smell of the glass gardens, the sound of the north wind rattling the shutters of her room. Needle was Jon Snow's smile." 10. "Sweet Evelyn, I think, I should have loved you better.Possessing perfect knowledge I hover above him as he hacks me to bits. I see his rough childhood. I see his mother doing something horrid to him with a broomstick. I see the hate in his heart and the people he had yet to kill before pneumonia gets him at eighty-three. I see the dead kid's mom unable to sleep, pounding her fists against her face in grief at the moment I was burying her son's hand. I see the pain I've caused. I see the man I could have been, and the man I was, and then everything is bright and new and keen with love and I sweep through Sam's body, trying to change him, trying so hard, and feeling only hate and hate, solid as stone." 11. "One boy's footprints are not long in being lost in the snow, in the steadily falling snow of the shortest day, the longest night; they are lost as soon as they are made. And once again the heath is clothed in drifting white. 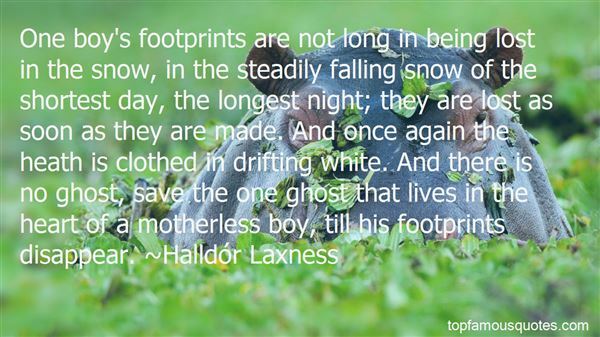 And there is no ghost, save the one ghost that lives in the heart of a motherless boy, till his footprints disappear." 12. "The heart of a mother is a deep abyss at the bottom of which you will always find forgiveness." 13. "That night, Sushila went to the puja room when she arrived home. Her house was small, with only a few rooms, but there had always been a puja room as long as she could remember. It was in the northeast corner of the house, and Sushila once asked her mother why they did not have a fancier bigger puja room. "We are small people and we will be happy with small gods. It is not the size of the space used for worship that matters," said her mother. "It is the size of your heart that matters. You can learn the lessons of Buddha and the Goddess in a prison, you do not need even this humble puja room. There are people in this town who are happy with much less than what we have." 14. "As her vision flickered one last time, the man was gone; it was her mother looking into her eyes.Her mother's eyes were filled with so much love that it seemed to release her from her pain and fear as it did when she was a small child. Her mother cradled her as a baby, rocking her back and forth. She was safe now in her mother's arms. She was at peace. Mommy, her heart sang, you're here to save me." 15. "My beloved has arrived, but rather than greeting him, All I can do is bite the corner of my apron with a blank expression- What an awkward woman am I. My heart has longed for him as hugely and openly as a full moonBut instead I narrow my eyes, and my glance to him Is sharp and narrow as the crescent moon. But then, I'm not the only one who behaves this way. My mother and my mother's mother were as silly and stumbling as I am when they were girls...Still, the love from my heart is overflowing, As bright and crimson as the heated metal in a blacksmith's forge." 16. "The mother memories that are closest to my heart are the small gentle ones that I have carried over from the days of my childhood. They are not profound, but they have stayed with me through life, and when I am very old, they will still be near . . . Memories of mother drying my tears, reading aloud, cutting cookies and singing as she did, listening to prayers I said as I knelt with my forehead pressed against her knee, tucking me in bed and turning down the light. They have carried me through the years and given my life such a firm foundation that it does not rock beneath flood or tempest." 17. 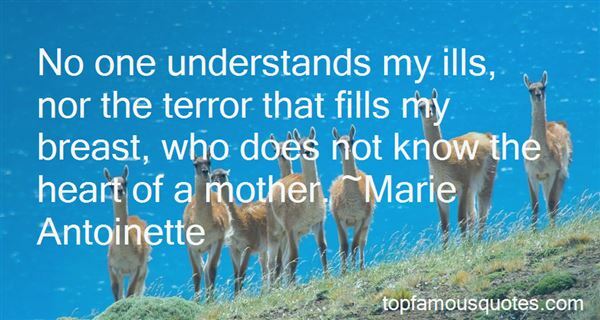 "No one understands my ills, nor the terror that fills my breast, who does not know the heart of a mother." 18. "After Mother got her picture, we all stood around the fire truck eating moon-shaped cookies dusted with powdered sugar that the mayor's wife had brought in some Tupperware. It was stuff like that that'd break your heart about Leechfield, what Daddy meant when he said the town was too ugly not to love." 19. "Would not the child's heart break in despair when the first cold storm of the world sweeps over it, if the warm sunlight of love from the eyes of mother and father did not shine upon him like the soft reflection of divine light and love?" 20. "Nothing that had ever happened to him, not the shooting of Oyster, or the piteous muttering expiration of John Wesley Shannenhouse, or the death of his father, or internment of his mother and grandfather, not even the drowning of his beloved brother, had ever broken his heart quite as terribly as the realization, when he was halfway to the rimed zinc hatch of the German station, that he was hauling a corpse behind him"
21. "You are so young, Lyra, too young to understand this, but I shall tell you anyway and you'll understand it later: men pass in front of our eyes like butterflies, creatures of a brief season. We love them; they are brave, proud, beautiful, clever; and they die almost at once. They die so soon that our hearts are continually racked with pain. We bear their children, who are witches if they are female, human if not; and then in the blink of an eye they are gone, felled, slain, lost. Our sons, too. When a little boy is growing, he thinks he is immortal. His mother knows he isn't. Each time becomes more painful, until finally your heart is broken. Perhaps that is when Yambe-Akka comes for you. She is older than the tundra. Perhaps, for her, witches' lives are as brief as men's are to us." 22. "Love is the only bow on Life's dark cloud. It is the morning and the evening star. It shines upon the babe, and sheds its radiance on the quiet tomb. It is the mother of art, inspirer of poet, patriot and philosopher.It is the air and light of every heart – builder of every home, kindler of every fire on every hearth. It was the first to dream of immortality. It fills the world with melody – for music is the voice of love.Love is the magician, the enchanter, that changes worthless things to Joy, and makes royal kings and queens of common clay. It is the perfume of that wondrous flower, the heart, and without that sacred passion, that divine swoon, we are less than beasts; but with it, earth is heaven, and we are gods." Any chance I'd get to see you in that bikini?" Zahara punched him in the arm. "No more talk of me in anything remotely skimpy or I'm gonna drop-kick you, got it?" ~Zahara and Bryan"